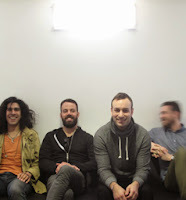 Brand New kicked off their spring tour tonight (April 8) in Denver, Colorado and treated fans in attendance to performance of a brand new song (that are assuming is titled) "Don't Feel Anything." The New Yorkers debuted the song at the Fillmore Auditorium, where someone in the audience caught it and immediately put it up on YouTube. There is word on if the song will end up on the band's long-awaited new album, that is expected to be released later this year.